Although I feel rather self-conscious relaying my life story for all to see, I also feel blessed with the most wonderful career to date. If sharing my adventures inspires others to pursue their dreams then so be it. It all started when I was a teenager involved in raising money for The Bansang Hospital in The Gambia, West Africa. It was through this voluntary work that I developed the desire to become a doctor and actually contribute in person. Academically, I then went on to complete an Intercalated BSc in International Health at the University of Leeds. 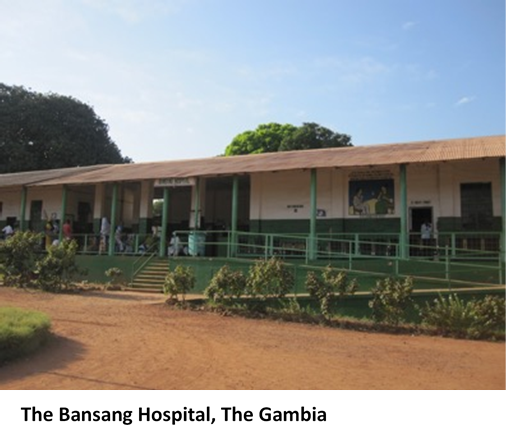 The research part of the degree was aimed at improving neonatal survival in the Bansang Hospital. We implemented a low-technology radiant heater and a training package for all midwifery staff focused on basic neonatal resuscitation and care. I attended over 120 deliveries during my 6-week placement at Bansang and 30 of the infants born during that period did require resuscitation using the very care package we had implemented. As it turns out, the radiant heater and practices we taught are still in use there some 13-years later. Almost certainly this would not have been true had we installed a high-technology radiant heater. My study results were later published by The Lancet online, and the project generated considerable newspaper coverage, helping to raise further awareness and funding for the project. One other passion of mine is ART and back in the UK I used this as an opportunity to raise money to support the development of a new children’s ward in Bansang. Recognising that many other medics also enjoy this recreational pastime, I organised the BangZang Art Exhibition consisting of over 300 pieces created by medical students and junior doctors. These were sold raising several thousand pounds for the cause. Later the event was awarded ‘Best Exhibition of the Year’ at the University of Leeds and continued for a number of years thereafter. Of course, during medical school, I snapped up every opportunity to travel and gain experience working in low- and middle-income countries (LMICs). In 2006, I led a team of medical students and junior doctors to help with the earthquake relief in Pakistan. Later that year I undertook my elective in St.Lucia and Cameroon; the latter focused on treating children with Burkitt’s Lymphoma. Between years one and two of Foundation Training, I undertook an Out-Of-Programme Experience (OOPE) and started to focus on paediatric surgery as a potential career. Again, international travel featured with attachments in Costa Rica and then New Zealand in colorectal surgery, paediatric surgery and emergency medicine. There was an opportunity to undertake research on empyema in children, which is particularly prevalent amongst the Polynesian population. To cap the year I spent a month with Professor Eric Borgstein and his team undertaking paediatric surgery in Malawi. During this time, I not only gained experience working within a diverse range of health systems and cultures, I also managed to build a strong CV by making sure I incorporated publishable academic activities throughout. 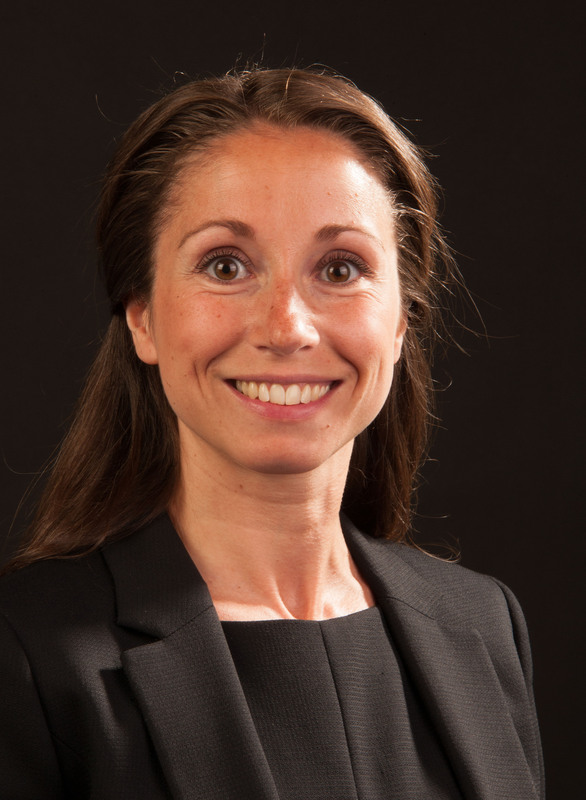 This proved vital when I returned, as I went on to gain my first choice Core Surgical Training rotations in London, at Great Ormond Street Hospital and King’s College Hospital. My placement at King’s proved particularly fortunate as it gave me the opportunity to meet two working surgeons who also had a passion for global surgery: Andy Leather and Niyi Ade-Ajayi (pictured). I became the surgical-lead for the King’s-Somaliland Partnership, a position I still hold today. This proved an incredibly rewarding experience and has helped to maintain my connections with King’s Global Health Centre throughout my surgical training. 2012 also marked the start of my research into children’s surgery in sub-Saharan Africa (SSA), including the publication of an international survey on gastroschisis. I am a firm believer that if one follows their passion and enjoys work then they will excel. Indeed, despite some discouraging remarks along the way regarding my global surgery activities, I subsequently topped the ranking at national selection and obtained my dream paediatric surgery rotation in London and the Southeast of England consortium. But of course work isn’t everything and I was soon blessed with a very important part of my personal development plan to date – I became a mum. Undoubtedly this has enhanced my understanding of children and my ability to empathise with parents. During a quiet part of my maternity leave I took the Diploma of Child Health with the RCPCH! A two and a half year period of paediatric surgery at the Evelina Children’s Hospital helped to consolidate my evolving surgical skill-set and I am now on an Out-Of-Programme for Research (OOPR) period. I still undertake regular day-case operating lists and oncalls there to keep in touch with practical life. 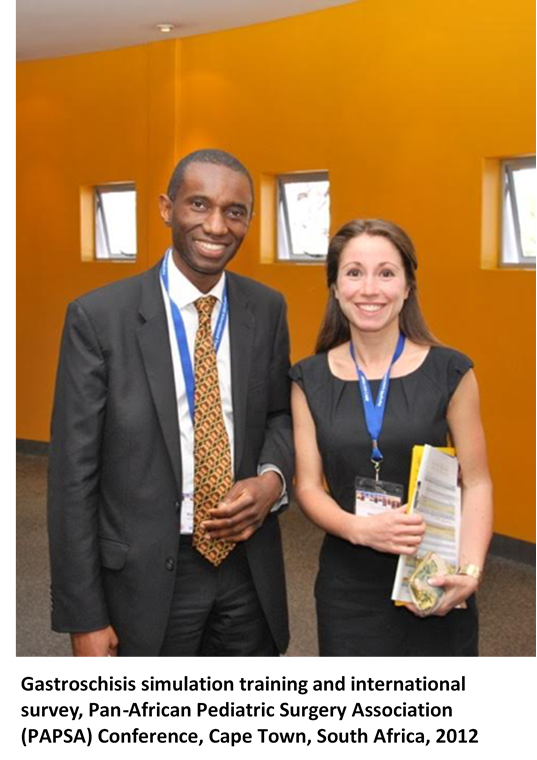 In 2016, I conceived the idea for the PaedSurg Africa study. This has been supported by a Royal College of Surgeons (RCS) Research Fellowship – the first to be awarded for a global surgery project. I hope this will open the door for many more to come. My research has involved establishing the PaedSurg Africa Research Collaboration consisting of children’s surgical care providers across SSA. Over 200 participated in the study drawn from 76 hospitals in 23 countries and data was collected on over 1400 children with common surgical conditions. This is the largest such prospective cohort study from the region and provides vital information to help improve outcomes, aid health planning and to advocate for the inclusion of children’s surgical care in National Surgical Plans being developed. Alongside the research fellowship, I seized the opportunity to complete the Masters in Global Health with Global Surgery at King’s College London receiving a Distinction. Building on this, I have recently been awarded funding to undertake a Wellcome Trust Clinical PhD in Global Health at King’s Centre for Global Health and Health Partnerships. 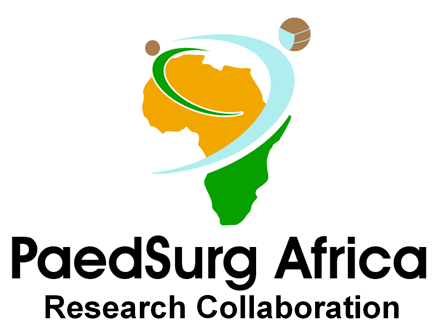 This will enable the expansion of the PaedSurg Africa Research Collaboration to form the Global PaedSurg Research Collaboration and undertake the first large-scale, geographically comprehensive multi-centre prospective cohort study of a selection of congenital anomalies across the globe. This is vital since congenital anomalies have risen to become the 5th leading cause of death in under 5-year olds globally. 97% of those deaths are in LMICs, yet there is a dearth of research from these regions. We shall also include data from high-income countries as a direct comparison and to encourage the involvement of more children’s surgical care providers in global surgical research. Participants will develop core research skills and become accustomed to using the REDCap online data collection tool. Data collection will be for a minimum of 1-month between October 2018 to April 2019. Please contact me for further information on the email below if you are interested in participating. All collaborators will be Pubmed citable co-authors of resulting international presentations and publication(s). During the PhD I am also developing and leading a multi-centre interventional study across seven tertiary paediatric surgery centres in SSA aimed at reducing mortality from gastroschisis. This was highlighted as a priority from the PaedSurg Africa study with a mortality rate from gastroschisis of 76% in SSA compared to <4% in high-income countries. In fact, in many centres mortality is up to 100%. The RCS generously ran their Christmas Charity Campaign in support of the project this year. The study will involve me spending 9-months travelling across SSA to implement the interventional bundle. I shall of course be taking my now 4-year old daughter and family – what an incredible life experience it will be for all of us! My mother, who happens to be a primary school teacher, will come along to home school my daughter. She is incredibly excited since she grew up in Sudan as a child whilst my grandfather, a plastic surgeon, was working there. So it seems this was all destined to happen. In addition to having the opportunity to undertake pioneering research, the OOPR has permitted me time to help in the establishment of the Global Initiative for Children’s Surgery (GICS). This is a collaboration of children’s surgical care providers with the vision of providing safe, timely, affordable surgical care when it’s needed for all children regardless of geographical location. 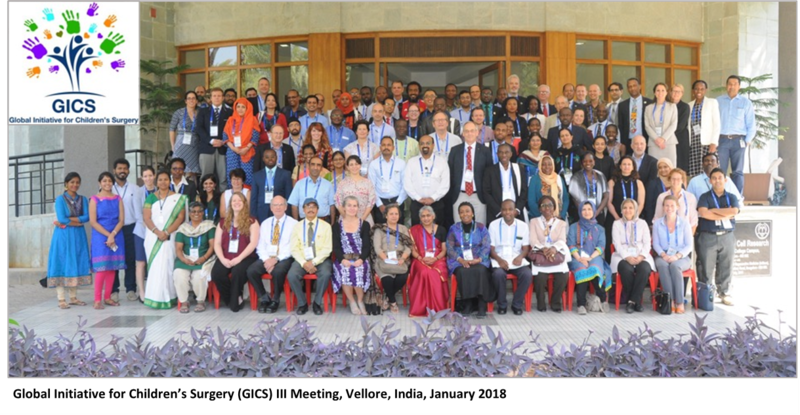 I recently had the honour of helping to organise the GICS III Meeting in Vellore, India. Notably, two-thirds of the 110 delegates, speakers and chairs at the meeting were from LMICs recognising that it is experts from these countries who have the greatest insight into what is required to improve care and outcomes for the children of their populations. Many key stakeholders presented at the meeting including the World Health Organisation, UNICEF, MSF, Ministry of Health representatives, charities, non-government organisations, philanthropists and all members of the multi-disciplinary team caring for children requiring surgery. Collectively, real progress is being made including the development of the Optimal Resources for Children’s Surgery (OReCS) document detailing, for the first time, what is required in terms of infrastructure, resources, staffing, training and research at every level of healthcare. This career path has allowed me to travel the world and meet the most incredible people, to develop advanced research and leadership skills, and most importantly to help children requiring surgical care across the globe. Following completion of my clinical training, my ambition is to take up a position where I can spend half my time operating for the NHS and the other half in Global Paediatric Surgery to help those who don’t have the privilege of the NHS.